A father and daughter at the airport in their last moments together. They had announced her departure and standing near the security gate, they hugged and he said, "I love you. I wish you enough." She in turn said, "Daddy, our life together has been more than enough. Your love is all I ever needed. I wish you enough, too, Daddy." They kissed and she left. He walked over toward the window where I was seated. Standing there I could see he wanted and needed to cry. I tried not to intrude on his privacy, but he welcomed me in by asking, "Did you ever say goodbye to someone knowing it would be forever?" "Yes, I have," I replied. Saying that brought back memories I had of expressing my love and appreciation for all my Dad had done for me. Recognizing that his days were limited, I took the time to tell him face to face how much he meant to me. So I knew what this man was experiencing. "Forgive me for asking, but why is this a forever goodbye?" I asked. "I am old and she lives much too far away. I have challenges ahead and the reality is, the next trip back will be for my funeral," he said. "When you were saying goodbye I heard you say, 'I wish you enough.' May I asked what that means?" He began to smile. "That's a wish that has been handed down from other generations. My parents used to say it to everyone." He paused for a moment, and looking as if trying to remember it in detail, he smiled even more. I wish enough 'Hello's' to get you through the final 'Goodbye.' 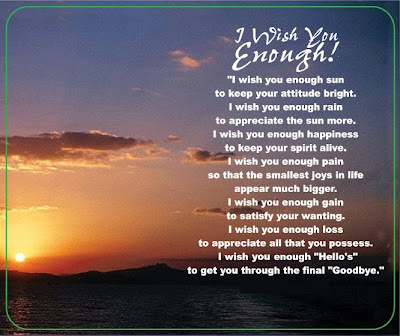 "
My friend, I wish you enough!